The excitement of marching that first pre-game and hearing the roar of the crowd is still fresh in the minds of thousands of rookie band members across the country. It's a feeling that will never leave a college marcher. However, this season is about more than that rush of adrenaline or road to a top bowl game. It's about finding a match. A match that would have incredible significance on the life of a mother, a son, a friend or even a college marcher. This season multiple bands have partnered with "Be The Match". According to BeTheMatch.org, the organization is operated by the National Marrow Donor Program (NMDP). It is a nonprofit organization that’s "dedicated to helping every patient get the life-saving transplant they need". They are leaders in advancing treatments for patients facing life-threatening blood cancers and providing critical research, innovative technologies, patient support and education that is needed to save lives. At Florida State the story is personal. 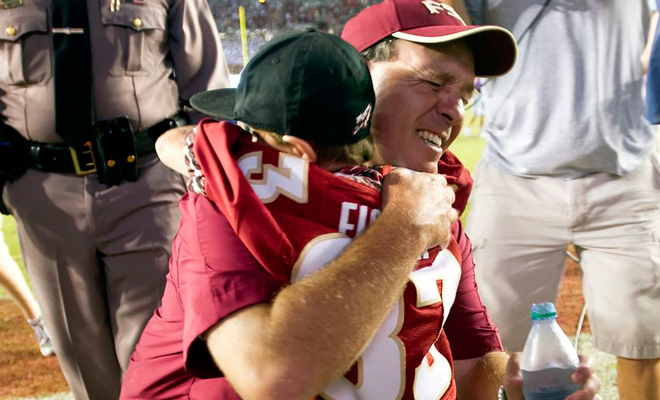 At the age of 5, Ethan Fisher, the son of Florida State Head Coach Jimbo Fisher, was diagnosed with Fanconi Anemia. It's a rare disease that only has a life expectancy of 30 years. Jimbo and his wife Candi, created a charity called Kidz 1st which is dedicated to help research this rare disease. Ethan Fisher is in need of a bone marrow transplant and Kidz 1st partnered with Be The Match. Many of Jimbo's former players have volunteered to donate, but very few have been the perfect match. Enter the Marching Chiefs. In order to help Kidz 1st, Be the Match comes out once a year to Tallahassee and takes DNA swabs from any Marching Chiefs member that is willing to participate. The level of participation is through the roof. So far, two members of the band have already donated marrow, with a third being prepared to give next month. "We have had 6 confirmed donors from our marching band events," said Ashley Collier, Coordinator of the "Banding Together" initiative for Be The Match. "Florida State had two, University of South Carolina had three and Clemson had one. Three donors from the same program is quite amazing. Usually getting one is a big deal, but three from the same program is a statistical anomaly." David Plack, Director of Athletic Bands at Florida State, said their efforts have been extremely important so far at FSU. "The odds of having one Marching Chief were pretty low not to mention having three students matched. Coach Fisher himself could not believe we beat those odds," said Plack. Earlier this year Coach Fisher visited the band at band camp and showed his support for their efforts. 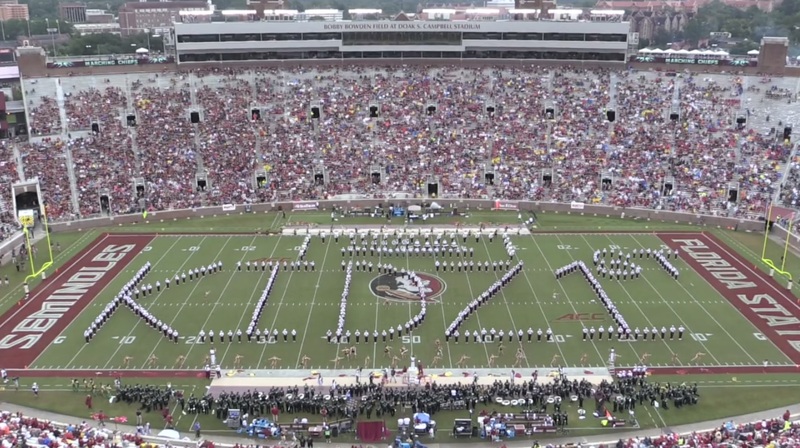 This past Saturday the band dedicated their halftime show to the Kidz 1st organization to continue to raise awareness and to encourage fans and alumni to join them in their efforts. The Marching Chiefs aren't the only band that has jumped on board with Be The Match. This year the Texas Tech Goin Band from Raider Land and the Baylor Golden Wave Band will compete against each other to see how many people they can register as potential donors. The bands will announce the winner at their game against each other on October 3rd. "While attending the CBDNA Athletic Band Symposium a representative from Be The Match spoke on other band programs doing this project," said Duane Hill, Director of the Texas Tech Goin Band. "I was seated next to a good friend and colleague of mine, Isaiah Odajima, Director of Athletic Bands at Baylor University, and we thought it would be fun to have a competitive spin to get as many band students registered as possible. It has now turned into a university wide effort from both universities to see how many people we can get registered." 1) Marching band members are the ideal age their patients need for the most successful transplant. 2) Bands are generally quite diverse and have representation from a variety of ethnicities. 3) They have shown they are committed- following through with the donation. 4) They are socially connected to a variety of groups on campus which allows for the inclusion of students outside of band. The "Banding Together" initiative has the potential to impact an incredible number of lives thanks to the large size of bands that are participating, but more are needed. "We partner with many other organizations, but the band program really took off this year and the energy is amazing," Collier told us. "They literally have a chance to save someone’s life. How many of us can truly say they have had this kind of opportunity or have ever saved someone’s life?" asked Plack.